Okay, most Telus internet users should know about the dreaded March 30th date. This is when Telus will start charging you, up to a maximum of $75 per month, if you go over your data allowance on your given internet plan. It might be frustrating to face such extra fees, but the reality is that other companies will join this movement. It’s like a price war at the gas pumps. Who loses and who gains from that situation? Sure other companies might be able to bite the bullet and not charge for overage, but are they just losing out on the extra possible revenue gains from people needing to pay for extra data per month? 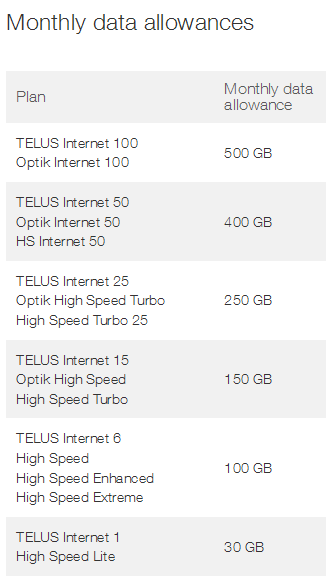 A lot of Telus customers are in the midst of a 3-year plan afterall. People might leave Telus over this issue. It’s just a matter of how long a company is willing to hold out for before telling their customers the bad news. Telus stepped up, so it’s a little less dramatic for other companies to follow suit. Before you know it, all companies charge for data overage. The days of not tracking or enforcing data are quickly vanishing. The rationale for such a move is debatable, but I’ll leave that rant for another time. You could have 150GB per month, which is about the average for all the plans. I have a very big piece of information which you need to realize. For some of you, it may be too late, but I would talk with billing if you’re looking at overusage fees in this first day of enforcement. Telus will be attempting communications with customers who are often going over their limits in the past to help them through this transition. I’m here to help you as a source of extra information. The real fact you need to know is that it’s not about the data you use from March 31st. In some places, it’s not even March. It will be anywhere from late March to July when you will be faced with possible overage (I prefer the phrase over usage) charges. The dates vary depending on the area. Only Telus can let you know that information for sure. All this said, I’m telling you that the key information is regarding your Telus internet billing cycle. Do you know from what day to what day your “month” actually is? For me it’s the 9th to the 8th of the following month. Therefore, if Telus is going to put the hammer down on March 30th, it’s going to apply to what sins I have committed prior to that date in that given billing cycle. So when the date of enforcement comes, you’re on the hook for everything prior to that date within the billing cycle. Confused? I sure was. If you take my billing cycle with a March 30th overage fee start date, I’m on the hook for all my data used from March 9th to April 8th. Even though Telus is saying it’s starting March 30th, that isn’t really the case. It’s what data I’ve used in the past before that date in the billing cycle. The point is you don’t start at a zero balance, and start worrying about data usage after the enforcement date. You need to first find out your date of enforcement in your area. Then you need to go into your account and see what you’ve been using over the past number of months. I am not very happy when looking at my stats. What irks me is that I haven’t been able to EVER view my internet usage since I’ve been a Telus internet and Telus TV user. That has been years and years. Now suddenly I need to digest what I might actually be using. It’s annoying to be sure. So if you’re planning on hitting the downloads while you aren’t being held accountable for your usage, I suggest you do as I say. Check the dates and realize the date Telus tell you will apply to that given billing cycle. Read more on Telus internet data allowances and how it’s going to affect you and what you can do about it. So depending on your home situation, you may have kids. We all know kids these days and their internet usages. What you really need to look at is if you’re near your limits, then perhaps going into the higher internet plan is just a better price option. That’s what I’m looking at doing. Instead of having Internet 15, I just talked to technical support and said that Internet 25 is available in my area. This wasn’t the case so Telus must have been upgrading, and they did say they are always upgrading in various areas. Thus, I will see how much the 25 plan is because not only is it faster, with a heck of a lot better upload speed for video conferencing, but it has a lot higher data limit cap. To be honest, with how integral internet has become, I don’t have any hesitations about paying for faster and better internet connections. I will have a follow-up regarding prices and whether upgrading plans is just a smarter solution or a “kill two birds with one stone” situation. Best Buy Canada is it? Good bye Future Shop.